The Oregon eviction notice forms are used in the event that a tenant is violating the terms of the lease or in the event landlord wants to end a month-to-month tenancy. It is very important that you serve the notice properly and wait the required amount of time before you file a complaint in court. Once the notice has been properly served and the requisite time period has past and tenant has failed to respond, at that point, the landlord may file a Residential Eviction Complaint and Summons in your Local Circuit Court. Once the case has been filed, you must have the tenant served by the end of the day after you filed. If the court finds in the landlord’s favor, it will issue a Judgment and tenant will be obligated to move out. 24-Hour Notice to Quit (Imminent Danger or Illegal Activity) – This notice may be served if the tenant is engaging in dangerous activities on the premises. 6-Day Notice to Quit (Non-Payment of Rent) – According to § 90.394 the landlord may not give this notice until the fifth (5th) day rent is late. 14/10-Day Notice to Quit (Non-Compliance) – Gives fourteen (14) days for the tenant to fix the noncompliance or vacate the property at the end of thirty (30) days. If it is the tenant’s second (2nd) violation of the same violation in the last six (6) months, the landlord has the option to cancel the lease and require the tenant to vacate within ten (10) days’ notice. 30-Day Notice to Quit (Month to Month Tenancy) – This notice is to alert a party of the intention not to renew a month-to-month tenancy. Rent is due on the date specified in the lease, however, a landlord may not provide notice until a minimum of 5 days after rent is late and then the tenant has 6 days to pay before the landlord can proceed. 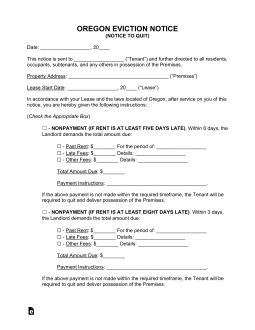 According to § 90.260 the landlord may not begin charging late fees or give notice for non-payment until the 4th day and it is specified in the lease. Step 2 – Once the requisite time period has elapsed and the tenant has failed to respond to the notice provided by the landlord, the landlord may seek redress in the Circuit Court representing the county in which the property is located. In order to begin an eviction case, the landlord must file a Residential Eviction Complaint and a Summons and pay a $79 fee. In addition, the landlord must provide copies of the notice he delivered to tenant. Step 3 – Once it has been filed, the court clerk will give you a copy of the summons and complaint to serve on the tenant. The Tenant must be served by the end of the day after the day the complaint was filed. The tenant will have the right to submit an Answer Form (See Laws) and defend themselves. Step 4 – The Court will set a date for a hearing and if the tenant fails to show up or the court finds in favor of the landlord, the court will issue a Judgment and the tenant will be obligated to move out. The notice on this page is available to download at your discretion. You may work with a word processing file by selecting either the “Word” or “ODT” buttons. If you prefer to work with a pdf editor, then select the “PDF” button. The first blank line of this page requires the full name of each Tenant who signed the violated lease. The body of this notice contains the wording required to inform the Tenant(s) of their violations and what is expected however you will need to provide information where required. Begin by entering the name of the city where the premises are located on the first blank line. The next two blank lines in this paragraph will continue to specify the physical location of the premises in focus. Supply the county and zip code where the property is located on the blank lines after the terms “County Of” and “Zip Code.” The last two blank lines will conclude our report on where the premises are located. Fill in the building number and street name and the apartment number where the rented property is located. This address must appear as it does in the lease. Now we will use the date when the violated lease was signed as a means of identifying it. Locate the Tenant’s signature date on the lease then report it as a two-digit calendar date, month, and two-digit calendar year on the last three blank lines in this section. The next section, below the bracketed label “Check Appropriate Box,” will supply a list of checkbox statements. Each one will supply a scenario defining how the Tenant violated the lease and/or what the Tenant is expected to do in response to receiving this paperwork. You must select one of the checkboxes in this section and supplement its language with the information it requires. If you are working on screen, most compatible editing programs will allow you to choose the applicable statement by left-clicking the checkbox with your mouse. If you do not have such software and must manually select the appropriate box, you may place an ‘x’ in it, checkmark it, or fill it in. If the Tenant is receiving this notice because the rent has been unpaid, then mark the first checkbox. This will require you name an individual to receive the owed money on the first blank line, report the dollar amount owed to the Landlord on the second and third blank line, then supply the rent amount due and the applicable time period (entered as a month name and digit year). Choose the checkbox labeled “Non-Compliance,” if this is the first time in the last six months the Tenant has violated the lease. You will also need to supply a deadline for the Tenant’s response. This date must be fourteen days after the Tenant’s receipt of this paperwork and should be presented using the first two blank lines in this paragraph. You must also detail what actions the Tenant is expected to take or refrain from to correct the violation on the last blank line of this statement. Finally, record the calendar date that is thirty days after the Tenant’s receipt of this paperwork using the last two blank line. This paragraph will mean the Tenant must enact this correction by the date you have supplied to it or vacate thirty days after this document is delivered. If this is the second time the Tenant has been warned regarding this violation in the past six months, then select the third checkbox attached to the second “Noncompliance” paragraph. This checkbox statement will require you to enter the calendar date when the Tenant will be expected to surrender the premises to the Landlord/Property Owner. This date must be at least ten days after the Tenant has physically received this notice. Select the third checkbox, if the Tenant is guilty of dangerous or illegal activity then select the third checkbox (“Immediate Danger Or Illegal Activity”) and is now expected to vacate the premises immediately. This statement contains a blank line where the Tenant activity that Oregon Revised Statutes § 90.396 & § 90.398 applies to must be defined. If you need more space to supply this description, you may either insert it with the editing program at your disposal or cite a properly labeled attachment containing this information. If this notice concerns a month-to-month rental agreement and the Landlord is issuing this paperwork, then choose the fourth checkbox labeled “Month-To-Month Tenancy. In addition to marking this checkbox, you must report the calendar date when the Tenant is expected to vacate the premises using the three blank lines presented. The calendar day should be supplied to the first line, the month on the second, and the year on the third blank line. Keep in mind this date must be thirty days after the Tenant has received this paperwork. If the Tenant is issuing a termination of a month-to-month lease agreement, then select the last checkbox labeled “Month-To-Month Tenancy.” Here, you will need to document the Calendar Date when the Landlord is expected to take control of the leased property utilizing the three blank lines included in this statement. This date must be recorded as the two-digit calendar day, month name, and two-digit calendar year.